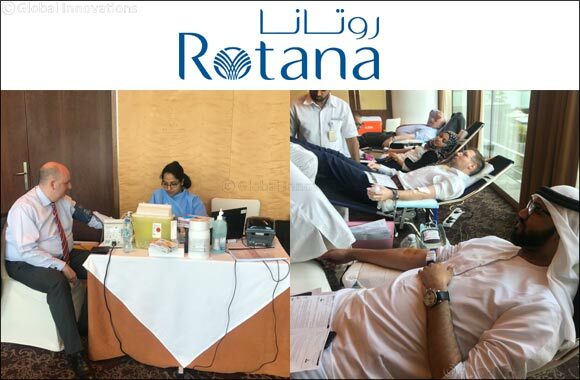 Dubai, UAE, October 21, 2018: BurJuman Arjaan by Rotana, Jumeira Rotana and Villa Rotana in collaboration with Dubai Blood Donation Centre organized a blood donation drive under the slogan of “Save Life, Give Blood” as part of reassuring their commitment towards the community. The 5 hours campaign raised awareness and resulted in gathering more than 50 colleagues and employees from Burjuman Business Tower who had the courage to be a blood donor. Commenting on the event Ulrich Hoffmeister, General Manager for BurJuman Arjaan and Jumeira Rotana said, “We have been driving the blood donation campaign for several years now; it became part of our culture to support this good deed and thus contributing towards the participation in saving lives of many people”. BurJuman Arjaan by Rotana, Jumeira Rotana and Villa Rotana are strongly committed to social welfare and supported several community and environmental initiatives such as: Earth Hour, Energy Conservation, Clean-Up Campaigns and collaborate and partner with different government entities like DEWA, Latifa Hospital, Rashid Centre for Disabled, Dubai Autism, and Dubai Foundation for Women and Children. Ms. Siji George, head of blood donation division and registration of blood donors at the Dubai Blood Donation Centre spoke about the importance of effective cooperation between blood banks and the various bodies and institutions to meet the demand for blood. She also thanked Rotana Hotels for this humanitarian gesture that will help save the lives of many who are in need of blood. Dubai Blood Donation Centre performs various humanitarian duties and one example is providing blood for Thalassemia patients who are in constant need of blood every 3 to 4 weeks. Transfusion of blood and blood products helps save millions of lives every year. It can help patients suffering from life-threatening conditions live longer and with higher quality of life and supports complex medical and surgical procedures. It also has an essential life-saving role in maternal and perinatal care.